Hey guys, just a quick update for you! So a couple of months ago, a female blogger followed me on Instagram. As I looked through her page, I saw great things. I commented on one her pictures that I wanted to repost and told her how I’d look forward to reading her work. I received an immediate response. And to my surprise, she had already read my blog and told me that it’s inspiring. She also shared a few kind words with me. This is really only the beginning for me so I was so encouraged and inspired to hear such nice things from someone who was in the place I hoped to be in the future. After a few months, I received another comment saying that she sat and read my blog for 30mins and loved it. She then asked for my email address. 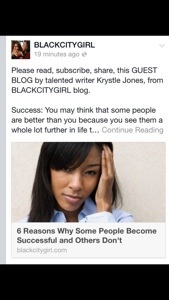 Not too long after, I received an email asking that I contribute an article to the Black City Girl website! A great opportunity and stepping stone for where I’m headed from someone who’s gotten there. I definitely appreciate the creator, Yvonne, for even taking the time to read my work. She’s a great person doing great things to inspire and encourage others. With all this said, make sure you visit blackcitygirl.com to see my article, ‘6 Reasons why some people become Successful and Others don’t” in the success section. Not only do I encourage you to read the article, I encourage you to keep working. No matter what it looks like. There were times I questioned whether my work was really reaching anyone. But because I continued, the opportunity presented itself. So even if it doesn’t look good, keep working and opportunities will begin to arise! Thank you for the post and congrats! I read your article on BCG and found it relatable, helpful and timely. Much success to you and your blog.